Tips and More from the Signet Fence Store Experts. A Bulldog Hinge is an easy to install and operate gate hinge that is typically used for commercial and industrial chain link gate installations. 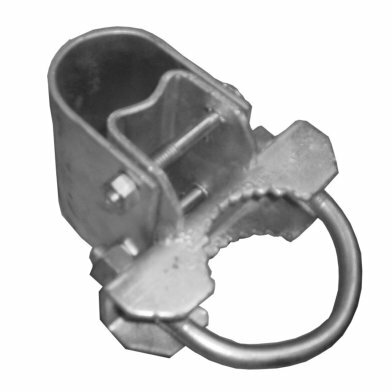 One end of a bulldog hinge is an adjustable pressed steel collar that fits around a 1 5/8 or 2" gate frame. The other end is a U-Bolt that goes around the post. The hinge must be installed so that one of the gate frame rails rests on the Bulldog Hinge collar so the the gate won't move vertically. A Bulldog Hinges is 90 degree hinges in that it will only allow the gate to open 90 degrees in either direction. However, it can be fitted with a hinge adapter which provides a full 180 degree range of motion for the gate. Useful tip: To prevent the bulldog hinge from scratching or cutting into the underside of your gate frame (which can lead to rust) you can use a bearing washer on top of the hinge to spread the weight of the gate.